When you compare, there's no comparison. At Passinglane, our number one focus is on delivering exceptional results for all our clients. 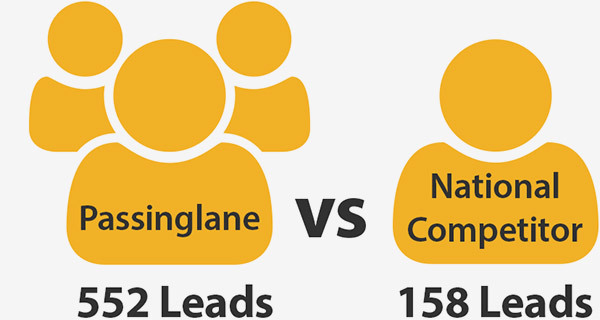 Take a look at this case study to see how our results stacks up against one of our national competitors. Over a just 45-day period, we tripled the number of sales for one of our clients. We doubled the number of page views for one of our clients. Over that same 45-day period, we increased the overall number of leads generated for that same client from 158 to 552. We increased the number of pages indexed in Google for the client’s website by 1,400! Which means more opportunities and better results!